Peter Beck, AIT, Austria: "Application of microdosimetry for radiation protection in aviation and space" can be downloaded here. Olivera Ciraj, Vinča Institute, Serbia: "Dosimetry for medical application of ionizing radiations: calibration requirements and clinical applications" can be downloaded here. Michael Moll, CERN, Switzerland: "Effects of radiation on particle detector performance" can be downloaded here. Dragoslav Nikezic, University of Kragujevac, Serbia, "Fukushima, description of the accident and consequencies to the environment" can be downloaded here. Alberto J. Palma, University of Granada, Spain: "Some advances in dose measurement with MOSFET for portable instrumentation" can be downloaded here. Ioana Pintilie, NIMP Bucharest, Romania: "Surface and bulk radiation induced defects in Si-based sensors" can be downloaded here. Guenther Reitz, DLR, Germany: "Radiation dosimetry on the International Space Station" can be downloaded here. Aleksandra Ristić-Fira, Vinča Institute, Serbia: "Research for Radiotherapy with Hadrons" can be downloaded here. Elisabeth Thieden, Bispebjerg Hospital, Denmark: "Sun exposure patterns; Lesson learnt using time-resolved personal electronic UV dosimetry" can be downloaded here. Ali Zadeh, European Space Agency, The Netherlands: "Space Radiation Hardness Assurance and Dosimetry" can be downloaded here. D. Nesheva, M. Ailavajhala, P. Chen, D.A. Tenne, H. Barnaby, M. Mitkova, "Study of Gamma Radiation Induced Effects in Ge-rich Chalcogenide Thin Films" can be downloaded here. E. Yilmaz, E. Tugay, A. Aktag, and R. Turan, "Influence of Gamma Irradiation on Silicon Nitride MIS Capacitors and Radiation Hardness" can be downloaded here. A. Mandowski, J. Orzechowski, E. Mandowska, "Anomalous Effects in Thermoluminescence" can be downloaded here. A. Yilmaz, G. Özbayoğlu, "Effect of synthesis methods, doping methods, metals and metal contents on the dosimetric properties of lithium tetraborate" can be downloaded here. K. Krezhov, "Neutron diffraction assisted investigations in condensed matter physics and materials science at INRNE – BAS" can be downloaded here. T. Paunesku, B. P. Aryal, C. He, D. Gorman-Lewis, S. Vog, B. Lai, L. Soderholm, M. P. Jensen, G. Woloschak "Plutonium interactions with cells in culture" can be downloaded here. S. Bajinyan, M. Malakyan, D. Yeghiazaryan, H. Aghjoyan, L. Vardevanyan, "Effects of low intensive 900-MHz RF-EMR on animal blood indices after single acute or fractional total body exposure" can be downloaded here. E.N. Gromozova, S.I. Voychuk, L.B. Zelena, I.A. Gretckey, "Microorganisms as a model system for studying the biological effects of electromagnetic non-ionizing radiation" can be downloaded here. B. Đorđević, D. Sokolović, A. Veljković, M. Marinković, J. Basić, G. Kocić, J. Nikolić, "Protective effect of melatonin on thymus of rats exposed to microwave radiation" can be downloaded here. D. Krstić, D. Zigar, D. Petković, N. Cvetković, V. Marković, N. Đinđić, B. Đinđić, "Modeling of penetrating electromagnetic fields of mobile phones in experimental animals" can be downloaded here. V. Zaporozhan, A. Ponomarenko, "Field nature of Life" can be downloaded here. J. Semkova, R. Koleva, S. Maltchev, N. Bankov, V. Benghin, I. Chernykh, V. Shurshakov, V. Petrov, S. Drobyshev, "Recent Observations of Space Radiation Environment in a Tissue-Equivalent Phantom onboard International Space Station by Liulin-5 Dosemetric Telescope" can be downloaded here. B. Zábori, A. Hirn, T. Pázmándi, P. Szántó, "Balloon-borne dosimetry measurements in the frame of the BEXUS student programme – the CoCoRAD experiment" can be downloaded here. J. Bezuidenhout, "Measuring low concentrations of naturally occurring uranium by analysing the 352 keV gamma ray peak of 214Bi" can be downloaded here. M. Zdraveska-Kocovska, O. Vaskova, V. Majstorov, S. Kuzmanovska, B. Crcareva, "RADAR and TLD effective doses to family members of hyperthyroid patients treated with iodine 131" can be downloaded here. O. Šveljo, S. Lučić, A. Peter, D. Kozarski, M. Lučić, "PET/CT patient dose and image quality" can be downloaded here. I. Mandić, "Online radiation dose measurement system for ATLAS experiment" can be downloaded here. M. Manolopoulou, M. Fragopoulou, S. Stoulos, W. Westmeier, M. Zamani, "Neutron spectrometry with He-3 proportional counters" can be downloaded here. M.A. Carvajal, F. Simancas, D. Guirado, J. Banqueri, S. Martínez-García, A.M. Lallena, A.J. Palma, "Evaluation of DMOS transistors as electron beams dosimeter" can be downloaded here. C. Fleta, C. Guardiola, D. Quirion, J. Rodríguez, G. Pellegrini, J.P. Balbuena, M. Lozano, F. Gómez, X. González, D. González, J. Pardo, F. García, "Ultra-thin 3D silicon detectors for active neutron detection" can be downloaded here. R. Duane, N. Vasović, P. LeCoz, N. Pavlov, C. Jackson, A. Jakšić, "Positron Detector for Radiochemistry on Chip applications" can be downloaded here. F. Torabi Nabil, S. M. Hosseini Pooya, M. Shamsaie Zafarghandi, M. Taheri, "Development of a diffusion chamber for passive discriminative measurement of radon/thoron concentration in dwellings" can be downloaded here. A. Ioannidou, M. Manolopoulou, S. Stoulos, E. Vagena, C. Papastefanou, L. Gini, S. Manenti, F. Groppi, "Fukushima fallout at Thessaloniki, Greece (40ºN) and Milano, Italy (45ºN)" can be downloaded here. F. Becker, C. Blunck, C. Figueira "Radiation exposure of medical staff: application of hand phantoms in experiments and simulations" can be downloaded here. K. Bodor, "Environmental and radiation protection at the KFKI campus" can be downloaded here. I. Krajcar-Bronić, B. Obelić, N. Horvatinčić, A. Sironić, J. Barešić, A. Rajtarić, B. Breznik, Borut, A. Volčanšek, "14C activity monitoring in the vicinity of the nuclear power plant Krško 2006 – 2011" can be downloaded here. W. Westmeier, "Supervision of the radioactive inventory in waste water systems" can be downloaded here. K. Theodorou, A. Sulieman, T. Topaltzikis, C. Kappas, "A survey of radiation dose to patients and medical stuff during different diagnostic procedures using TLD dosimetry" can be downloaded here. L.V. Messa, C. Paradiso, E.M. Messa, M. Enrico, G. Messa, U. Arrigucci, "Proposed use of Magnetic Resonance in the evaluation of the safety of mechanical devices for physical training: a study of subjects undergoing training with experimental apparatus" can be downloaded here. B. Máté, M. Horváth, J. Somlai, L. Kovács, T. Kovács, "210Po activity concentration of blood samples after the radon inhalatoric therapy" can be downloaded here. D.R. Hadnađev, O. Nikolić, S. Stojanović, "Justification of computerized tomography examinations and radiation risks in everyday radiological practice" can be downloaded here. S. Petkovska, M. Ginovska, H. Spasevska, N. Dimitrovska, "TLD postal dose quality audit for 6MV and 15MV photon beams in radiotherapy clinical practice" can be downloaded here. B. Basarić, O. Čudić, M. Teodorović, B. Petrović, M. Baucal, L. Rutonjski, Lj. Smiljanić, "Two field breast plan vs. optimized conformal breast plan: comparison of plan parameters" can be downloaded here. J. Somlai, A. Kopek, G. Szeiler, P. Gergely, T. Kovács, "Radiation dose originating from radon and radon progeny effecting workers in the show Cave of Tapolca (Hungary) can be downloaded here. K. Ivanova, V. Badulin, "Indoor radon measurement in former uranium mining regions in Bulgaria" can be downloaded here. Z.S. Žunić, P. Bossew, C. Carpentieri, N. Veselinović, S. Radanović, O. Čuknić, V. Udovičić, J. Filipović, Z. Stojanovska, F. Bochicchio, "The Serbian radon mapping project: overview, status, further plans" can be downloaded here. Z. Stojanovska, B. Boev, M. Ristova, Z.S. Žunić, Z. Curguz, J. Januseski, "Annual and seasonal variations of indoor radon concentrations in Skopje" can be downloaded here. V. Udovičić, A. Dragić, R. Banjanac, D. Joković, B. Grabež, Z.S. Žunić, J. Filipović, "The influence of the radon variability on dose assessment" can be downloaded here. H. Reçi, S. Dogjani, E. Dushi, "The relation of radon concentration with tectonics that caused the earthquake of September 2009, in Gjorica, with magnitude 5.5" can be downloaded here. V. Spasić Jokić, I. Župunski, B. Vujičić, Z. Mitrović, V. Vujičić, Lj. Župunski, "Calibration of current integrators used with ionization chambers" can be downloaded here. D. S. Pressyanov, "Retrospective radon and thoron measurements by home stored CDs/DVDs – research and practice" can be downloaded here. V. Gershan, M. Ristova, Z. Ivanovski, "Evaluation of the HOLOGIC Selenia FFDM system with tungsten tube" can be downloaded here. O. Marinković, V. Prokić, S. Rafailović, Z. Mirkov, "First mobile linear accelerators in Serbia - preliminary TLD results" can be downloaded here. M. Tavakol, A. Karimian, S.M. Mostajab Aldaavati, "Assessment of dose distribution in human eye proton therapy by Monte Carlo method" can be downloaded here. G. Đorić, G. Stojić, "Ionizing radiation in printed media in Serbia" can be downloaded here. R. Koleva, B. Tomov, T. Dachev, Y. Matviichuk, P. Dimitrov, "Is the terrestrial magnetosphere a natural radiation shield on Moon space missions?" can be downloaded here. Z. Mijatović, R. Kobilarov, "Sun's UV radiation and ozone layer thickness: Results of monitoring during year 2011" can be downloaded here. I. Bikit, D. Mrđa, N. Jovančević, M. Ugarčina, N. Krstić, S. Todorović, "Non-Ionizing radiation measurements in Vojvodina" can be downloaded here. B. Stepanovski, "Assessment of SAR in the human head, caused by mobile phone with measurement of the emitted electric field" can be downloaded here. B. Vulević, Č. Belić, T. Stalevski, "In-situ measurements of electric, magnetic and electromagnetic fields in the environment" can be downloaded here. M. Blagojević, Lj. 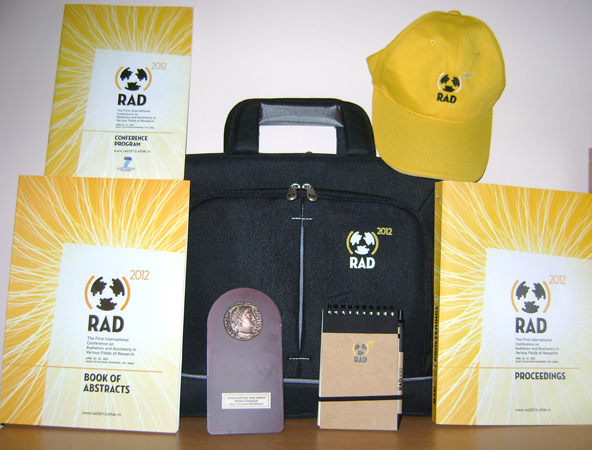 Vračar, "Magnetic field dosimeter" can be downloaded here. "FIRST STEPS INTO THE BIG SNOW - Marie Sklodowska Curie" (The life of fighting against discrimination), story told by Mimoza Ristova can be downloaded here.